The Tropang Texters left nothing to chance as they disposed of the hard-luck Air21 Express and claimed the best record in the elimination round of the PBA Governors Cup. Relentless were the Tropang Texters in closing out their elims stint with six wins against only two losses. Reserve forward Mark Yee fired 20 points to lead seven Talk n Text players who finished in double figures in what also became the highest-scoring game at least this season. Talk N' Text 145 - Yee 20, Reyes 19, Peek 18, Williams 14, Fonacier 14, De Ocampo 14, Baker 10, Castro 9, Alapag 8, Carey 7, Aban 5, Alvarez 4, Lao 2, Oreta 1. 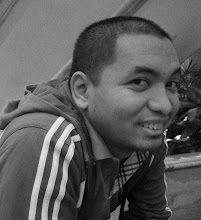 Air21 116 - Bangura 25, Urbiztondo 14, Sharma 14, Avenido 13, Seigle 13, Canaleta 11, Najorda 8, Cabahug 4, Espiritu 4, Hontiveros 3, Arboleda 3, Juntilla 2, Salvador 2. The Powerade Tigers found a reason to celebrate even if they didn’t make the playoffs. On Celino Cruz’s heroics, the Tigers brought down the curtains on their season and finished their campaign in the PBA Governors’ Cup with a victory against the Meralco Bolts. Cruz scored only five points but his 3-point shot – his only basket in the fourth quarter – with 32 seconds remaining shoved Powerade ahead for good after Meralco tied the game at 81-81 on a steal and a lay-up by Sol Mercado with 45 seconds to play. Powerade 86 - David 17, Porter 15, Lanete 14, Espino 10, Reyes R. 7, Antonio 7, Reyes J. 5, Cruz 5, Quinahan 2, Macapagal 2, Laure 2, Allera 0. Meralco 81 - Oguchi 27, Mercado 20, Cardona 13, Isip 6, Hugnatan 6, Aljamal 3, Menor 2, Espinas 2, Taulava 2, Weinstein 0, Omolon 0, Ritualo 0. Barangay Ginebra, the Commissioner’s Cup second placer, was right on that very spot, tied with two other teams, at the close of the PBA Governors Cup elimination round. The Kings established control with a fiery attack in the second quarter and went on to beat the Rain or Shine Elasto Painters to the delight of the cheering Ginebra throng at the Araneta Coliseum. Donald Sloan poured in a game-high 32 points while Mark Caguioa added 13, including eight in the homestretch as the Kings reigned over the Elasto Painters and caught up with the Alaska Milk Aces and the Petron Blaze at second place at 5-3. Rain or Shine 90 - Reid 29, Buenafe 20, Chan 12, Cruz 8, Norwood 7, Belga 5, Vanlandingham 3, Jazul 3, Rodriguez 2 , Tang 1, Arana 0, Ibanes 0. Talk ‘N Text head coach Chot Reyes said one of his intentions in replacing their import, Maurice Baker, was to catch Alaska off guard. The Tropang Texters blasted the Alaska Aces to open their semifinal round in the PBA Governors’ Cup at the Araneta Coliseum. Larry Fonacier scored a game-high 21 points including 3-of-5 shooting from three and Ryan Reyes made six of eight 3-point attempts and finished with 20 points. Reynolds tallied 18 points while Kelly Williams turned in a double-double with 12 points and 12 rebounds for Talk 'N Text. Talk 'N Text 103 - Fonacier 21, Reyes 20, Reynolds 18, Williams 12, Castro 9, Alapag 9, Peek 7, Carey 4, Aban 3, Yee 0, Dillinger 0, Alvarez 0, Lao 0. 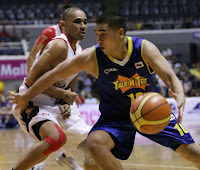 Alaska 85 - Forte 22, Tenorio 16, Thoss 14, Custodio 10, Dela Cruz 10, Reyes 6, Gonzales 6, Eman 1, Borboran 0, Dimaunahan 0, Cablay 0. Arizona Reid fired a personal conference-best of 41 points but missed a make-or-break shot, allowing B-Meg to complete a stirring come-from-behind 99-98 win over Rain or Shine. James Yap scored 23 points to pace the Llamados who also drew double-digit outputs from new import Myron Allen (18), Devance (17), Simon (17) and Marc Pingris (10). B-MEG 99 - Yap J. 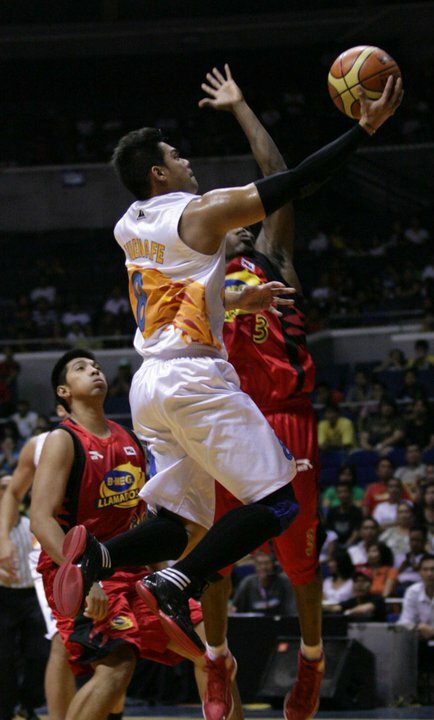 23, Allen 18, Devance 17, Simon 17, Pingris 10, Allado 8, Yap R. 4, Urbiztondo 2, Gaco 0, Reavis 0. RAIN OR SHINE 98 - Reid 41, Buenafe 12, Chan 10, Vanlandingham 7, Norwood 7, Belga 6, Arana 6, Tang 5, Ibanes 4, Jazul 0, Cruz 0, Rodriguez 0, Kramer 0. 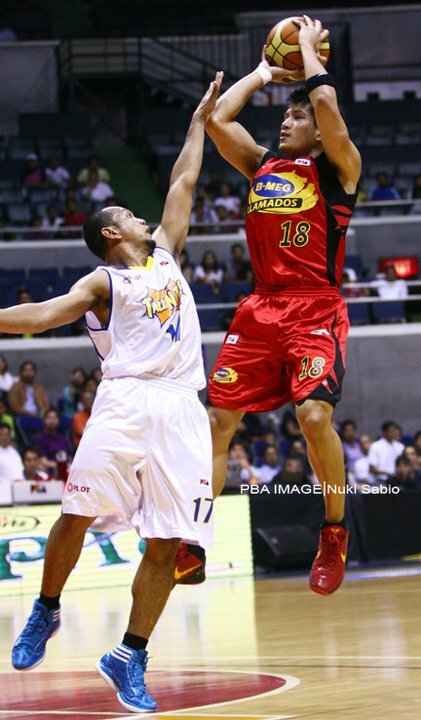 Jason Forte scored a new PBA career-high 36 points, but provided Alaska more in an win over Petron Blaze. Forte also grabbed 16 rebounds for his 10th double-double in as many games and gave Alaska some show of emotion that head coach Tim Cone wanted as a spark for the team. 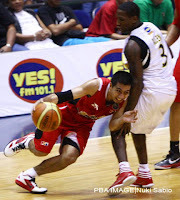 Alaska 88 - Forte 36, Custodio 11, Dela Cruz 10, Cablay 9, Gonzales 7, Thoss 6, Tenorio 4, Reyes 3, Eman 2, Borboran 0. 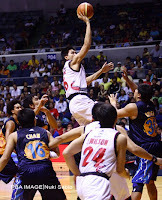 Petron 81 - Grundy 22, Al-Hussaini 16, Cabagnot 10, Salvacion 7, Duncil 6, Santos 6, Pennisi 5, Miranda 5, Ildefonso 2, Yeo 2. Donald Sloan and Mark Caguioa dished out huge performances, carrying Barangay Ginebra to a fourth win in its last five games and into solo second place after the second play date of the PBA Governors Cup semifinal round. Sloan churned out near triple-double numbers with 26 points, 13 rebounds and nine assists while Caguioa put in a personal season best of 33 points as the Kings crushed the B-Meg Llamados. 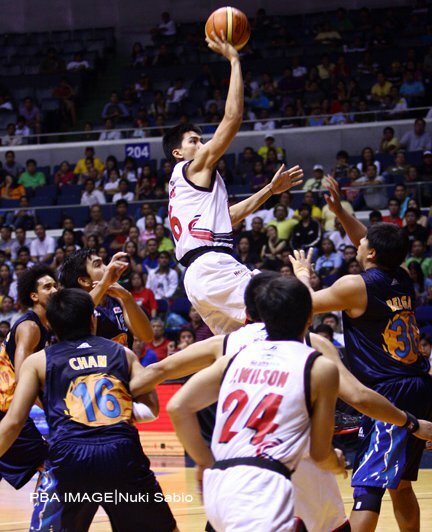 Ginebra 99 - Caguioa 33, Sloan 26, Wilson W. 10, Wilson J. 7, Intal 6, Tubid 6, Mamaril 6, Helterbrand 5, Labagala 0, Canaleta 0, Cortez 0, Menk 0. B-Meg 79 - Yap J. 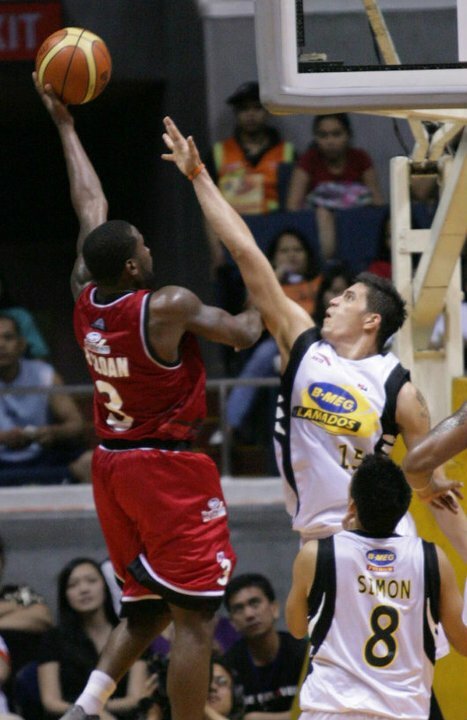 19, Allen 17, Pingris 13, Devance 11, Yap R. 6, Urbiztondo 5, Simon 4, Allado 4, Gaco 0, Fernandez 0, Reavis 0. Coach Yeng Guiao still left his indelible print for his Rain or Shine team despite sitting out Wednesday’s game against Talk ‘N Text. With the Elasto Painters taking to heart their suspended tactician’s words, they drubbed the Tropang Texters to fan their hopes in the PBA Governors’ Cup semifinal round. Arizona Reid notched game-highs of 30 points and 20 rebounds while his local teammates chipped in their ample share on both ends of the court, but substitute coach Caloy Garcia said it was Guiao’s previously laid-out gameplan and motivational speeches that spelled the biggest difference. Rain or Shine 96 - Reid 30, Chan 12, Cruz 10, Tang 10, Buenafe 10, Arana 9, Belga 6, Norwood 3, Rodriguez 3, Ibanes 3, Vanlandingham 0, Jazul 0, Matias 0, Ferriols 0. Talk 'N Text 81 - Reynolds 18, Reyes 15, Carey 9, Yee 8, Williams 8, Peek 6, Alapag 5, Oreta 4, Castro 3, Dillinger 2, Fonacier 2, Alvarez 1, Aban 0, Lao 0. In dire situation at the half, Anthony Grundy talked to his teammates about the need to play with their hearts out. Grundy showed the way and his teammates followed as Petron Blaze charged from a 28-point third-quarter deficit and roared on in overtime to stun Barangay Ginebra. Grundy stood tall with a near triple-double job with 21 points, 11 rebounds and nine assists. He himself sent the game into overtime with two charities with 14.2 seconds left. PETRON 96 - Grundy 21, Santos 19, Cabagnot 16, Ildefonso 14, Al-Hussaini 10, Duncil 10, Guevarra 4, Pennisi 2, Baclao 0, Miranda 0, Salvacion 0. GINEBRA 88 - Sloan 25, Caguioa 23, Canaleta 7, Intal 6, Tubid 6, Menk 6, Helterbrand 5, Mamaril 4, Wilson J. 2, Wilson W. 2, Cortez 2.
with their eighth win in 11 games. 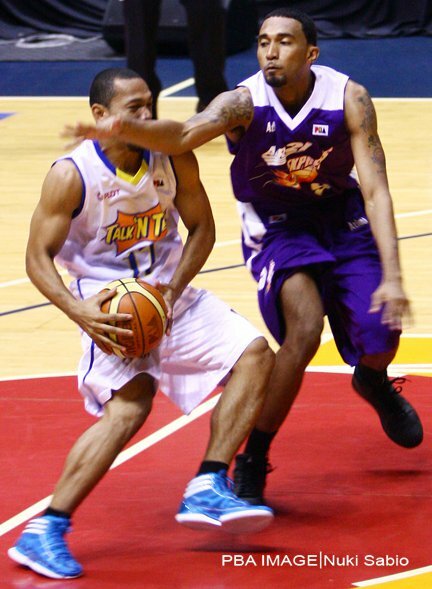 Talk ‘N Text (101) - Reynolds 37, Castro 15, Williams 12, Fonacier 8, Carey 8, Peek 7, Reyes 5, Alapag 5, Dillinger 4, Aban 0, Lao 0. B-Meg (89) - Yap J. 18, Pingris 15, Allado 14, Allen 12, Devance 9, Simon 8, Urbiztondo 5, Reavis 4, Gaco 4, Fernandez 0, Adducul 0. Fighting with tremendous grit and guts returning from a big letdown Wednesday, Barangay Ginebra got back on track, regaining solo second in the PBA Governors Cup semifinals with a win over the Alaska Aces. Mark Caguioa and Donald Sloan dealt the Aces much punishment with the former coming through with a game-high 26 points and the latter getting away with 21 points, seven assists and six rebounds. GINEBRA 81 - Caguioa 26, Sloan 21, Helterbrand 8, Wilson J. 6, Intal 4, Wilson W. 4, Tubid 4, Mamaril 4, Cortez 2, Menk 2, De Ocampo 0. 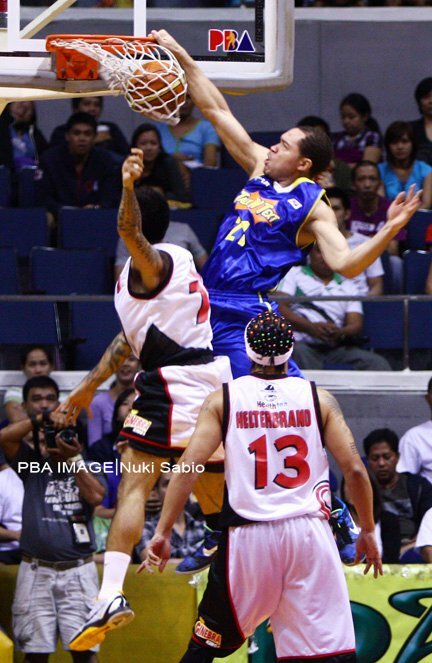 ALASKA 77 - Thoss 24, Tenorio 16, Forte 14, Custodio 6, Cablay 5, Gonzales 4, Dela Cruz 4, Eman 2, Reyes 2, Borboran 0. Rain or Shine 102 – Reid 33, Buenafe 30, Rodriguez 12, Norwood 11, Jazul 5, Ferriols 4, Belga 3, Tang 2, Chan 2, Cruz 0, Ibanes 0, Arana 0. Petron Blaze 86 – Grundy 23, Santos 16, Miranda 8, Salvacion 8, Duncil 6, Al-Hussaini 6, Cabagnot 5, Ildefonso 5, Pennisi 5, Yeo 2, Hubalde 2. Alaska drew another career game from Jason Forte and thus had its Finals quest in the PBA Governors Cup alive and still very much kicking. With Forte anchoring a sterling all-around game on a conference-high 42 points, the Aces had little trouble disposing off the B-Meg Llamados. Local support was aplenty, with Sonny Thoss, Tony dela Cruz and LA Tenorio chipping in at least 10 points each. Tenorio also had eight assists. 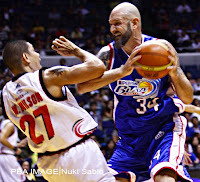 ALASKA 105 - Forte 42, Thoss 17, dela Cruz 15, Tenorio 10, Borboran 9, Custodio 7, Thiele 3, Reyes 2. B-MEG 86 - Yap J. 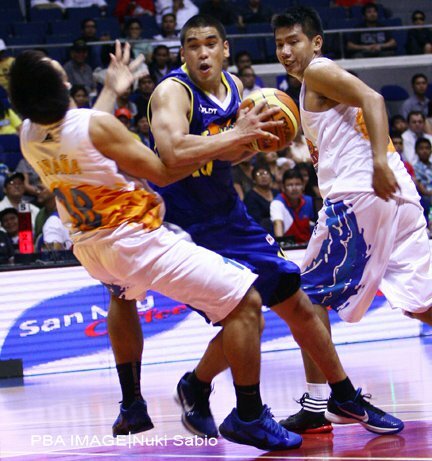 25, Simon 18, Urbiztondo 9, Devance 7, Pingris 6, Reavis 6, Allen 5, Gaco 4, Allado 4, Fernandez 2. Talk 'n Text has paved the way for a homestretch run to complete a grand slam season. The Tropang Texters made a giant step towards achieving a Triple Crown in reasserting their mastery of the Barangay Ginebra Kings to reach the PBA Governors Cup Finals. Scottie Reynolds fired six triples and finished with a total of 25 points with Kelly Williams adding double-double numbers with 17 points and 11 rebounds. Reynolds, Jimmy Alapag and Jarred Dillinger combined for 6-of-9 three-point shooting as the Texters made a key run from 26-27 down, building an 18-point spread at the half. 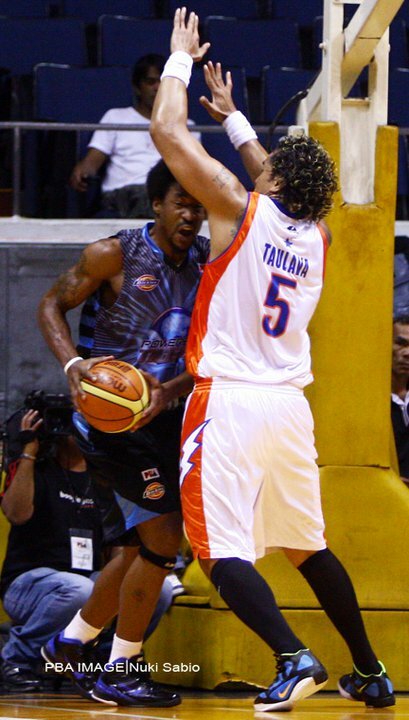 TALK N' TEXT 102 - Reynolds 25, Williams 17, Castro 12, Carey 11, Alapag 11, Fonacier 10, Peek 8, Dillinger 6, Reyes 2, Aban 0, Alvarez 0. GINEBRA 90 - Sloan 27, Caguioa 16, Canaleta 11, Wilson J. 9, Wilson W. 9, Mamaril 6, De Ocampo 6, Labagala 5, Helterbrand 1, Intal 0, Tubid 0, Menk 0.